Lately, my thoughts have been drawn to the concept of "cult of personality", at least a fairly general version of that concept. In the world of finance and the markets, there are a number of people who seem consistently to get significant attention, and from all sides: from the media, from the investing public, even from "the market". Earlier in my career, Alan Greenspan became a sort of rock star. Via his role at the Federal Reserve, he came to wield considerable influence over the sentiment of the financial markets. In a similar but different way, Suze Orman and Dave Ramsey serve as examples of people who grew to considerable fame and influence in the field of personal financial advice; without commenting on the actual quality of their advice it is possible to observe that Orman and Ramsey share something with Oprah: their celebrity and the willingness of the public to take their advice are intertwined on some level. And then I consider Warren Buffett. Is there anyone cited more frequently as an example of a super-star investor? 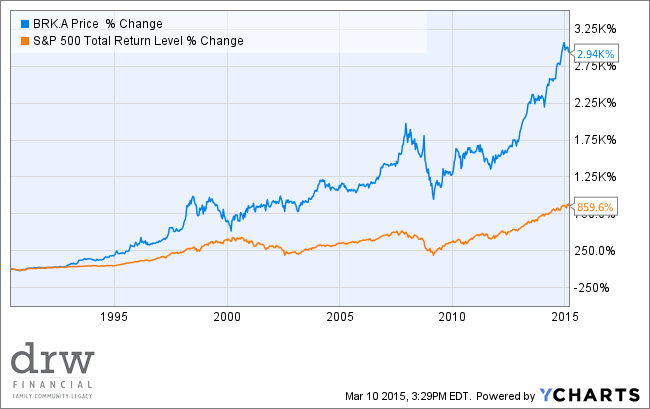 Does Bill Gross or George Soros or Sir John Templeton inspire as much attention in the media? It is a fact that Buffett's company, Berkshire Hathaway, has thoroughly trounced the market (defining the market as the S&P 500 total return index) over the long run. His company ranks among the top 5 publicly traded companies in the world. His personal net worth is second in the world. So, all of that to say, I think Buffett's status as a pro investor is legitimate. The challenge or conflict for me comes in when I see how individual investors who aspire to emulate Buffett engage with or understand his example. It may seem harsh or defeatist, but individual investors cannot invest like Warren Buffett (or his company, Berkshire Hathaway). Consider this Buffett quote from a recent NY Times article: "“Our emphasis has shifted in a major way to owning and operating large businesses." The implication is that Buffett is primarily interested in companies he can own, not merely invest in. Consider the deal in 2013 when Berkshire Hathaway bought Heinz. Buffett paid twenty three billion dollars for control of the company. He paid a 20% premium to the prevailing market price, and made Heinz part of Berkshire Hathaway. Even earlier in his career, before his company had the resources to pull off $23B deals, Buffett made it his mission to amass positions in his investments sufficient to exert some measure of control. The challenge for non-billionaire investors is that it is difficult to buy this type of ownership in large, successful publicly traded companies. That 400 million shares of Coca-Cola? That's $1.6 billion today. "confidence building" purchase in Goldman Sachs in a timely manner, he got very favorable terms. What can the rest of us do, then? To be clear, it is possible for an everyday investor to apply the valuation techniques and intellectual rigor to their investment choices that Buffett himself employs. There is no secret magic to learning to read a balance sheet and income statement and to making a careful analysis of a business's operations and prospects. In a nutshell, that is what investors are supposed to do. And aspiring to own companies, to become wealthy, and to accomplish philanthropy on the scale of someone like Warren Buffett are all worthwhile goals...it is just that "investing like Buffett" is an inherently complicated notion.